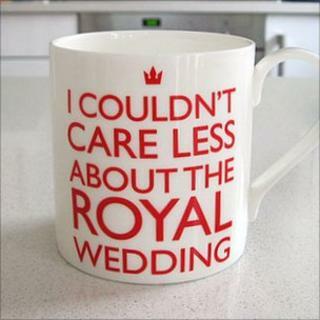 A Staffordshire designer has produced a line of ceramics objecting to what she calls the "media frenzy" over the royal wedding. Prince William and Kate Middleton marry on 29 April. Camila Prada's pottery mugs are being marketed as the 'Sorry but…' brand. She said: "I like the royal couple, but the reaction has been too much. I also think much of the memorabilia is less than creative." Ms Prada, who graduated with an MA in Ceramic Design from Staffordshire University, works in Tamworth, south Staffordshire. She said: "I was in the supermarket and saw that every magazine on the rack mentioned the royal wedding. "And then I heard that girls were wearing copies of Kate's ring. And I thought, why do we follow all this so slavishly? It's almost degrading." The designer, who has also worked on commissions for museums, said that she was not a republican or anti-royal. "This is about our consumer culture." She also said she had been dismayed that so much memorabilia was "poor quality from abroad". "I feel passionately that we feel better if products we use are made close to home." The 'Couldn't care less' mug is manufactured in Stoke-on-Trent.